Free State has some of the most prolific and finest writers in South Africa but in the past they were seldom given enough national acknowledgement and platform to showcase their work in various parts of the country. Thankfully as a result of the superb talent and literary achievements of several Free State born writers both based in the province and in other provinces as well as efforts of platforms such as Free State Writers and the Bloem Poetry Movement, many people across South Africa and internationally are beginning to take note of and interest in writers and poets from the Free State. One of the exceptional literary activists from the province, Bloemfontein-based poet and journalist, Raselebeli 'Magic' Khotseng (left, pix above) gave Durban an appetizing taste of the literary elegances distilled in Bloemfontein and the Free State when he recited at two events paying homage to Black Consciousness thinker and activist, Stephen Bantu Biko. 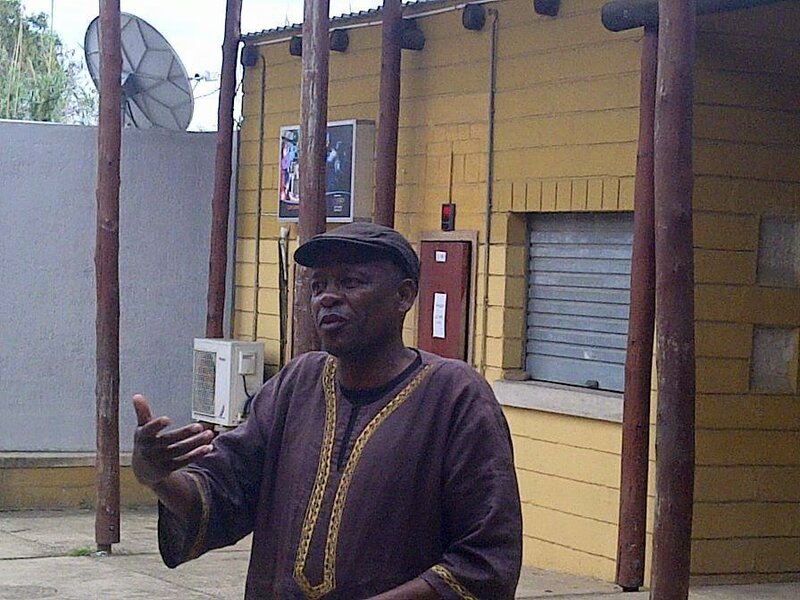 Khotseng first enthralled the lovers of the spoken word and the young people most of whom expressed their connection to Biko’s ideals and thoughts because of their daily realities and experiences in the township at the Remembering Biko: Conversations and Verses event held at Ntuzuma F Library on the 11 September 2015. This event was jointly hoisted by Slam Poetry Operation Team (SPOT) and its sister organization, the Nowadays Poets, and Ubuciko Bomlomo Infotainment. 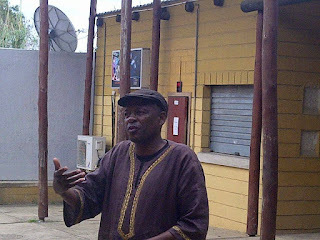 An exponent of Black Consciousness himself, Khotseng (above, at the occasion) eloquently shared the personal and socioeconomic experiences that brought him into the broad Black Consciousness Movement and motivated him to employ literature and community work as mediums of self-healing, community-healing, sociopolitical awareness and development. As a child Khotseng witnessed his family moving from a relatively adequate house and site to a three-room house built by the apartheid regime as a result of the forceful removal of his community from Batho location to Rocklands. As if this was not enough, his migrant labour father was tricked by a policeman who convinced him to exchange his three-room house for a two-room house in Bochabela ostensibly because of the latter’s proximity to the city. This experience and the broad socioeconomic conditions of Black people saw Magic Khotseng becoming a student activist, first with Congress of Azanian Students Organization and later with Azaanian Students Movement. His activism in Black Consciousness Movement led him to conferences and campaigns in which he experienced and was inspired by the performances of Ingoapele Madingoane, Matsemela Manaka and Mafika Gwala. Khotseng experience of growing without a mother, literally being raised by the community, motivated him to work with the displaced children – so-called street kids- through the Iphahamiseng Community Child Centre. His work with these children resulted in his debut poetry collection, “Hold Back Your Tears”. His upcoming book, which is earmarked to be launched in 2016, “The Son will grow”, is dedicated to his mother and the community of Mangaung which taught him that a child is raised by a community. Khotseng’s story resonated well with the young people from the INK area (Inanda, Ntuzuma and Kwamashu), which was selected as the nodal point for the government’s urban renewal program and has one on the highest levels of poverty and unemployment. But it is when he articulated himself in the language of poetry and music, teaching the young people some of the classic freedom songs and reciting sociopolitical poetry that Khotseng had the audience on the feet, calling for more. The piece that caught the imagination of the audiences was “If wishes were horses”. In this poem Khotseng eulogizes the colorful, exotic and breath-taking natural beauty of mother Africa. He takes the readers\audiences on an idyllic tour of the continent where they walk in Masai Park enjoying the serene beauty of Kenyan landscape, climbing mount Kilimanjaro and taking a dive in the Atlantic Ocean, and then ruthlessly wakes them up from their slumber with subtle but poignant allusion to the socioeconomic realities and systemic and structural arrangements that are a barrier to the capacity of the majority of Black African people to tour their countries and their continent, let alone access some of the most exquisite and historical sites in Africa. Khotseng’s Durban recital comes few weeks before one of Mangaung’s son and perhaps one of the most industrious and committed young literary activist and cultural worker Free State, Serame ‘Icebound’ Makhele will be featured in the prominent Poetry Africa Festival hosted by the UKZN’s Centre for Creative Arts (CCA) from the 12th October to the 17th October 2015. Icebound is a founder and convener of Bloem Poetry Movement which hosts monthly sessions in collaboration with PACOFS. Bloem Poetry has developed performance skills of many local poets. Icebound was selected to coordinate the Macufe Poetry Festival in 2014 and is currently part of the Free State Cultural Ensemble initiated by the provincial Legislature. The ensemble includes dance, music, drumming and poetry and has performed in this year’s Africa Day Celebrations and FS Women’s Month dialogues. If the poetic magic that Khotseng exhibited at Verses for Biko and Tosh is anything to go by, the Durban audience can prepare themselves to be bewitched by the Bloemfontein literary potion when Icebound takes the stage at Poetry Africa.